There are many restaurants in Edinburgh’s Old Town and the castle has a restaurant too, but if it's a nice day, pack a picnic lunch to eat on the castle grounds. This will not only save you money, but also allows you to enjoy a beautiful and historical location for lunch. The road leading to the castle is cobbled and rather bumpy for strollers. Be prepared! Pack a picnic lunch to have on the castle grounds. There is plenty of open, grassy space and picnic tables at Edinburgh Castle. Also, kids under 5 get free admission to the castle. There's so much to see and in do in Edinburgh for families, it's hard to pick where to start. This kid-friendly itinerary is a great way to soak up some of the culture and history of the Old Town. 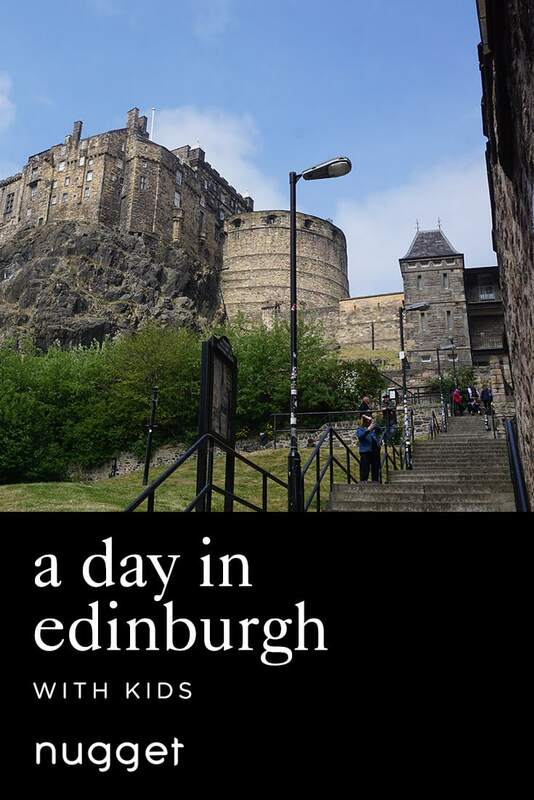 Start with a visit to the impressive Edinburgh Castle, a must-see for anyone visiting this wonderful city. Ice cream from Mary's Milk Bar is the perfect way to refuel, before heading to the National Museum of Scotland, which has many things for little eyes and hands to discover. Edinburgh Castle is an impressive specimen, towering over Edinburgh’s Old Town, atop Castle Rock. It has a rich history as a residence of royalty and a military garrison. It is not to be missed if you are in Edinburgh, especially if you have any little (or big) castle lovers in your tribe. The castle houses the Stone of Destiny, where Scottish kings and queens have been crowned for centuries, as well as the Scottish Crown Jewels. Our family enjoyed seeing the vast display of weaponry and suits of armour - even armour for a little boy! DIRECTIONS Edinburgh Castle is at the top of the Royal Mile in Edinburgh's Old Town. Simply follow the road right up; you can't miss it. TIP Make sure you enjoy the bagpipers on your way up the Royal Mile. They are a great way to get you in the mood for some Scottish history and the cultural immersion. Mary's Milk Bar is a fun little ice cream shop with a vintage feel, serving some of the best ice cream you will find in Edinburgh. The flavours are unique and delicious, and the servings are generous. I loved the walnut-flavoured ice cream, and our little nugget enjoyed smearing the strawberry all over her face and clothes. One of the best parts is the location. Mary's Milk Bar is situated with a great view of Edinburgh Castle from below, and it is in one of the oldest parts of Edinburgh. This is a great place for a break and a treat. DIRECTIONS Mary's Milk Bar is only a 10-minute walk from the castle. Head back down towards the Royal Mile, turning right onto Castle Wynd (there are some stairs here). Walk down a few minutes, then turn right onto Grassmarket. Follow along this road until you see the milk bar (ice cream shop) on your left. TIP The shop is tiny, so you might not manage to get a seat inside, but there is some outdoor seating in the square just opposite of the shop. The National Museum of Scotland is a great way to end your day. It is huge and filled with many things to delight your whole family. There is a whole section dedicated to animals and dinosaurs, an area full of technological wonders and many ancient artefacts for the history buff. Most of the areas in the museum have plenty of interactive games and activities for kids, and if you are here with little ones, don't miss the area dedicated to preschool children - it has plenty of activities perfect for curious little minds and hands! Best of all, the museum is completely free. It is hard to get through the whole museum in just one afternoon. We loved this museum so much we came back another day! DIRECTIONS The National Museum of Scotland is about an 8-minute walk from Mary's Milk Bar. Walk back up Grassmarket towards Heriot Bridge, then continue onto Cowgatehead. At the roundabout, turn left onto Candlemaker Row, and continue on until you reach George IV Bridge. Turn left, then right onto Chambers Street, where you will find the museum. It's big, so it's hard to miss. TIP Allow plenty of time to visit the museum. There is lots for kids and parents to discover here.